Take a look at that album cover. 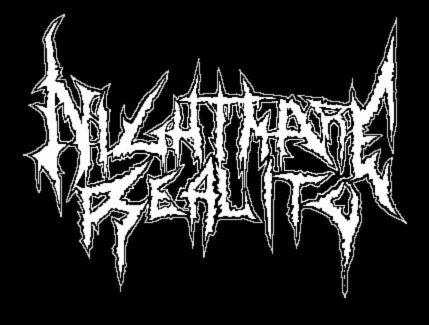 The new logo and awesome "Warhammer" artwork look nothing like the cover of the band's debut album, so one has to wonder if the band even sounds the same. Well, not really. Sometime after "In Battle There Is No Law!" 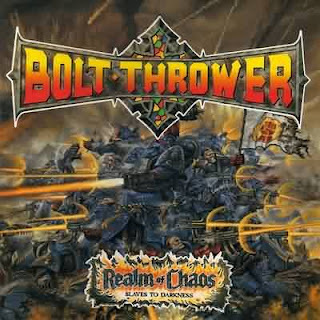 was released, Bolt Thrower must have gone on a doom metal binge, because "Realm of Chaos (Slaves to Darkness)" is way heavier than the band's previous full-length. The sound here is a perfect bridge between the US death metal bands and the Swedish death metal bands (Who would later release their first full-lengths). Bolt Thrower didn't play at 200 mph and riddle their music with blast beats, nor did they possess a chainsaw guitar tone backed by d-beats. They had their own sound, and what a glorious sound it was. As mentioned earlier, Bolt Thrower decided to slow things down. They went from wicked fast riffs on "In Battle There Is No Law!" to some crushing, mid-paced madness on this record, and the transition was amazing. Every single track on this album has at least one riff or moment that will get the listener's headbanging, with "World Eater" being my choice for maximum whiplash. It isn't just the riffs that make this album though, but the groove that is created from the guitar tone and tempo. The tone isn't as thick as Entombed's, but it's plenty heavy and a lot more doomy. Simply put, if you don't find at least one instance where your head is bobbing uncontrollably, you are a false and may not entry. Bolt Thrower didn't completely abandon their inner speed junkie, but they effectively mixed the faster riffs with the slower ones and they did so flawlessly. "Through the Eye of Terror" and "Lost Souls Domain" are great examples of this. One minute you're enjoying the mid-paced mayhem and the next, Bolt Thrower decides to channel their inner Slayer and your neck will thank you later. There aren't any complaints that can really be made about this album. It's one of the heaviest albums ever recorded and has a great mix to please just about everyone. Now quit being a pansy and put on your big boy/gal pants, grab your preferred alcoholic beverage, put the album on and proceed to damage your neck.